If you want to save your phone from getting damaged with stains or scratches, a personalised Nokia 8.1 case is the only way! Don’t get a boring usual phone case if you can get a custom phone case just like you ever wanted. Choose your favourite foto, logo or design and upload it in the customizer. Maybe you want to show with a sports club you support, or which your favourite band is? 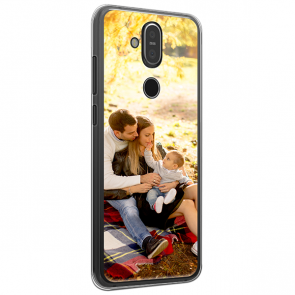 Also pets and family is always a good option to create your own Nokia 8.1 custom case. It is as easy as it sounds, give it a try! Do you know this feeling? You buy a new phone and it looks super fancy, but to protect it from damage, you need a case. So you buy one, put it on your phone and the slim, chic design is gone. No worries, we got you. Design a Nokia 8.1 custom case! Your phone gets the protection it needs but instead of hiding it in a case, you can express your style and personality through a personalised Nokia 8.1 case. The design process is very easy, thanks to our user-friendly customizer. If you should have any issues with your custom phone case you can always write to our support team.